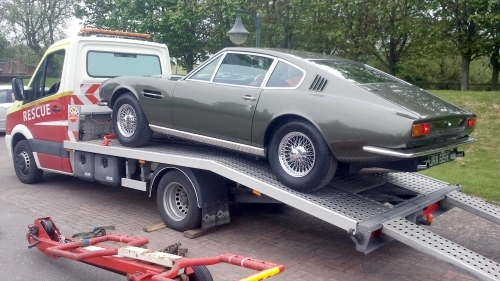 Classic car servicing in Oxfordshire. Classic cars repaired, serviced and maintained. We also offer a recovery service. We cover a wide variety but only Pre Electronic cars. Old school, Carburettors and Distributors, as well as all the usual service and repairs. Body panels, sills, etc, replacements, welding and painting. Mot re-commissioning, if your vehicle has been off the road for some time. Our area covers Oxford, Aylesbury, Buckingham, Bicester, Witney and Abbingdon. Fiat 500, with a common problem - rear drive shafts broke their moorings. 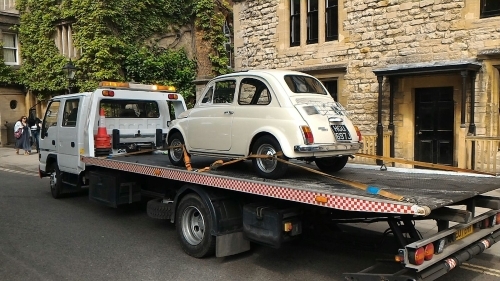 The Fiat was driven by its occupants from London to Oxford, they had a lovely day site seeing and the little car was jealous, it refused to return home! After repairs and servicing it was soon back on the road. The most expensive Aston Martin DBS. But even that was not a recipe for success if the Webber carburettors filled up with rust dust from the fuel tank. It too was upset by being left in a dark garage in London for 18 months. Driven from London to Oxford, it refused to go further!